The ancestry of Poppa, wife of Rolf the Ganger, 1st Duke of Normandy, seems to have two versions. It now appears that Poppa was a daughter of Gui, Count of Senlis and not a daughter of Count Berenger of Bayeux. This makes Poppa, through her mother, a great granddaughter of King Bernard of Italy (b. 797, d. 818; King of Italy 813 - 817) King Bernard was a grandson of Charlemagne. GANGER ROLF, "The Viking" (or ROLLO), banished from Norway to the Hebrides ca. 867, 890 participated in Viking attack on Bayeux, where Count Berenger of Bayeux was killed, and his dau. Poppa captured and taken, 886, by Rollo (now called Count of Rouen) as his "Danish" wife. Under Treaty of St. Claire, 911, rec'd the Duchy of Normandy . . ..
For Line 121E, Weis gives as his source "Moriarty, The Plantagenet Ancestry, pp. 10-11, 13." This refers to the 300 page manuscript of George Andrews Moriarty: The Plantagenet Ancestry of King Edward III and Queen Philippa. Professor Moriarty (1883 - 1968) never felt that his work was "finished" and he never published his manuscript which was donated to New England Historical Genealogical Society in Boston. The manuscript was photocopied and printed by the Mormon Pioneer Genealogical Society, Salt Lake City, Utah, in 1985. Please recall that Professor Moriarty felt that his work was never "finished"; and observe that he has a note to "See p. 226" under the details of Poppa. According to Dudon, William Longue Épeé of Normandy had as his 'avunculus' (maternal uncle) Count Bernard of Senlis, the friend and consellor of Hugh the Great. The Chronicon Rothomagense (Labbe Bibliotheca Manuscriptorum Nova, I, p. 365) ano 912 confirms this and stated that Rolf married the daughter of Count Gui de Senlis, so if Bernard were the son of Gui, he would be the 'avunculus" of William. Dudon, however calls Poppa the daughter of Count Berenger, but Dudon is not highly trustworthy. 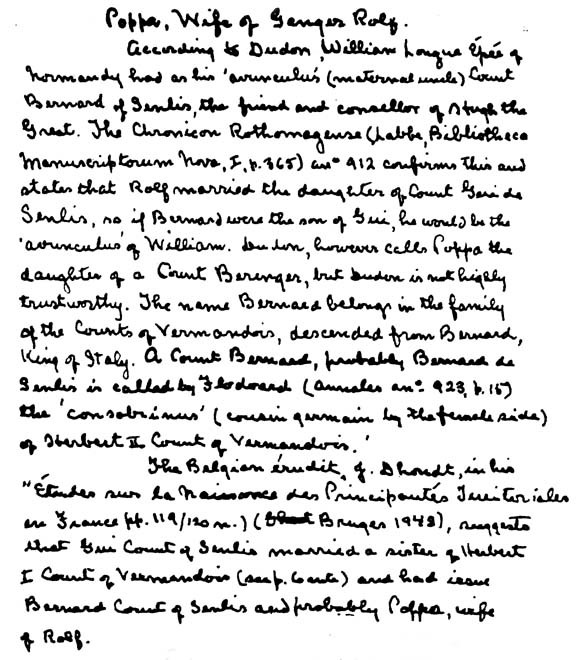 The name Bernard belongs in the family of the Counts of Vermandois, descended from Bernard, King of Italy. A Count Bernard, probably Bernard de Senlis is called be Flodoard (Annales ano 923, p. 15) the 'consobrinus' (cousin germain by the female side) of Herbert II Count of Vermandois. The Belgian érudit, J. Dhondt, in his "Études sur la Naissance de Principautés Territoriales au France pp. 119/120 n.) (Bruges 1948), suggests that Gui Count of Senlis married a sister of Herbert I Count of Vermandois (see p. 6 anti) and had issue Bernard Count of Senlis and probably Poppa, wife of Rolf. Hence, the best evidence to date seems to indicate that Poppa, wife of Rolf the Ganger, 1st Duke of Normandy, was a daughter of Gui, Count of Senlis and a great X3 granddaughter of Charlemagne.